You are at:Home»Afghanistan»Maj. Gen. Ronald Bailey: The next Marine commander in Afghanistan? With two leadership moves, it’s become apparent who could lead Marine forces in Afghanistan next summer. 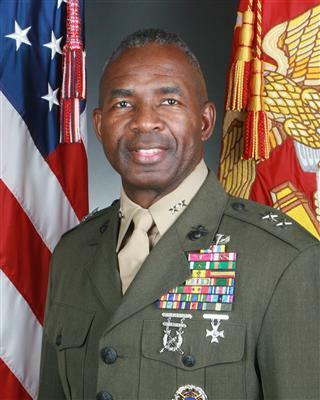 The Marine Corps has shifted Maj. Gen. Ronald Bailey from Recruiting Command, out of Quantico, Va., to 1st Marine Division, out of Camp Pendleton, Calif. In his place at Quantico, Brig. Gen. Joseph Osterman took over this week. If the Corps keeps a similar footprint in Afghanistan next year, that means Bailey could lead Marine forces in Afghanistan, assuming I Marine Expeditionary Force (Forward) replaces II MEF (Fwd. ), commanded by Maj. Gen. John Toolan, on a typical schedule next spring. Toolan took over for Maj. Gen. Richard Mills as the top commander in Regional Command-Southwest in March. In the rear, both generals led their respective divisions, and took over the forward-deployed MEF when it set up shop in Afghanistan. Osterman, meanwhile, is still relatively fresh from the battlefield himself. He headed 1st Marine Division (Fwd.) for a year beginning in spring 2010, serving under Mills. He graciously sat with me in Afghanistan last May for an interview that led to this story. For Bailey, it has been a year in transition. As his official biography shows, he was promoted to his current rank in May 2010 while serving as commander of the Corps’ west coast recruiting region and Marine Corps Recruit Depot San Diego. He assumed command of Recruiting Command in Quantico in January, after former commander Maj. Gen. Robert Milstead became the three-star head of Manpower and Reserve Affairs.